Sony has announced yet another update to its Vaio range with the CW series, coming with HD multimedia functionality and a variety of colours. The new range comes with a Blu-ray drive on board, as well as an HDMI output, and to improve the HD capability further there's also an NVIDIA GeForce GT 230M GPU supplied. 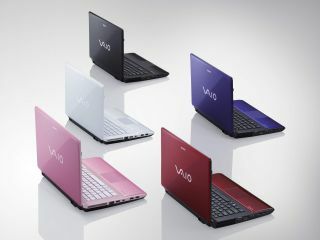 Sony is tipping this range as having "chic looks and powerful, easy-to-use features," and to that end will be offering blue, pink, red and white versions of the CW Vaio. It also apparently has inside a "calm, muted interior, accented by a colour-graduated palm rest," although it just looks like a keyboard to us. The screen isn't too shabby either: a 14-inch, 16:9 widescreen effort with LED backlighting for good contrast ratio and power reduction. Sony is tipping the notebook to come with either 320GB or 500GB of HDD storage, so there will always be enough room to store your content. The CW Series will be available from 22 October, although there's no word on pricing as yet.